It’s the ultimate in floor space conservation. If your garage ceiling has enough clearance, you just might be able to park two cars in the same stall. Not two Range Rovers or two monster trucks, but two low-profile sedans or sports cars should fit nicely. Savvy homeowners that don’t have multiple garage stalls, and don’t care to build another stall, can opt to install a four-post car lift that elevates one car high enough to park a second car beneath it. While a car lift is a great solution for sandwich-parking cars, when open, a standard garage door typically interferes with the elevated car. The remedy is to convert the existing garage door to a high lift door. No reframing is necessary, and the exterior appearance of the door will not change. Passersby will never know the difference. Because no structural changes take place, you probably won’t need to pull a permit to do the job either. On a standard 7-foot garage door, the tracks curve gently and then level into a horizontal plane about eight feet above the garage floor. That’s fine for one vehicle, but if you lift a car within a closed garage, it will block the garage door from opening. If you only want to lift a single car to work on it from beneath, you can do so without converting your garage door to a high lift. However, keep in mind that you won’t be able to open the garage door while the car is elevated. 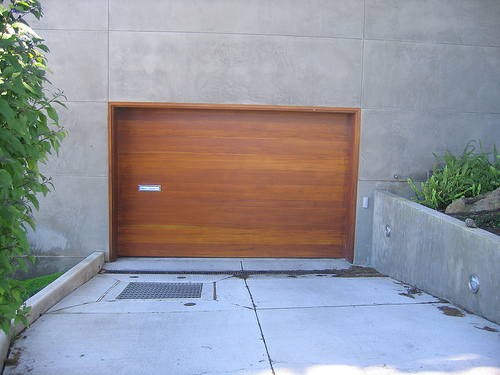 Converting to a high-lift garage door involves changing the trajectory of the door tracks so they extend vertically before curving back into the garage. This is accomplished by adding new vertical tracks above the existing door opening, replacing the torsion spring, roller drums and cables, and installing new hangers for the elevated horizontal tracks. You can buy a high-lift conversion kit but you should hire an experienced garage door contractor to do the installation. Torsion springs require winding to a specific torque, or tension, which can be extremely dangerous if you don’t know what you’re doing and the spring slips. Your best bet is to buy a high-lift conversion kit already customized to fit your garage dimensions. The kit distributor will need to know the measurements of the existing door and the distance from the garage floor to the ceiling, minus 12 inches to allow for installation. For example, if you have a standard 7-foot garage door and an 11-foot ceiling clearance, that gives you 4 feet from the top of your garage door to your ceiling. After subtracting the 12 inches necessary for the install, you could gain up to 3 feet in door height when the garage door is open. Not all ceilings are 11 feet high, however, and some garage doors are taller than 7 feet, so careful measuring is vital. If you have a 9-foot door right now, you might need only a few additional inches of clearance to sandwich-park two vehicles. You can usually find a custom high-lift installation kit for under $400, but you’ll pay that much, or more, in labor to have it professionally installed. Another thing to consider is your garage door opener. Standard openers typically sit just above the door tracks and have a cable track that bolts into the structural header over the garage door. After installing the high lift door, the old opener might not fit in the space above the door. Jackshaft-type openers that install on either side of the elevated door tracks operate the torsion spring to raise and lower the new door without obstruction. These openers are slightly more expensive than standard garage door openers and start around $275, not including the labor cost of installation. Alternately, you can always open and close the door manually. One of the biggest misunderstandings homeowners have about high-lift doors is thinking that a high-lift door will provide more clearance to pull a high-profile vehicle or RV into the garage. Because the garage door itself, and the rough opening do not change, if you have a 7-foot garage door, you will still have a 7-foot garage door after the installation of a high-lift conversion kit. The only way to get a high-profile vehicle into your garage is to remove the existing header and construct a new header above it, which means you’ll also have to buy a higher garage door to fit. Glenda Taylor writes for Networx.com.